Grab a sheet pan and whip up these Easy Teriyaki Roasted Vegetables for a quick + tasty side dish! This one pan recipe pairs great with noodles, rice, tofu, or shrimp. As a food blogger, I sure get stuck in my share of food ruts. I find a sauce/dish/veggie I love and put it on heavy rotation until my husband basically begs for something new to eat. Lately it’s been shrimp and veggie bowls with my trusty homemade Szechuan sauce. I’ll amp up the Sriracha content of the sauce and pretend it’s something new, but really it’s the same scrumptious sauce on repeat. Desperate to shake things up, I decided I needed a good old fashioned sweet-and-sassy teriyaki sauce in my face. The ingredients are similar, but the sticky sweetness of this sauce was a welcome wake up call to my veggie game. 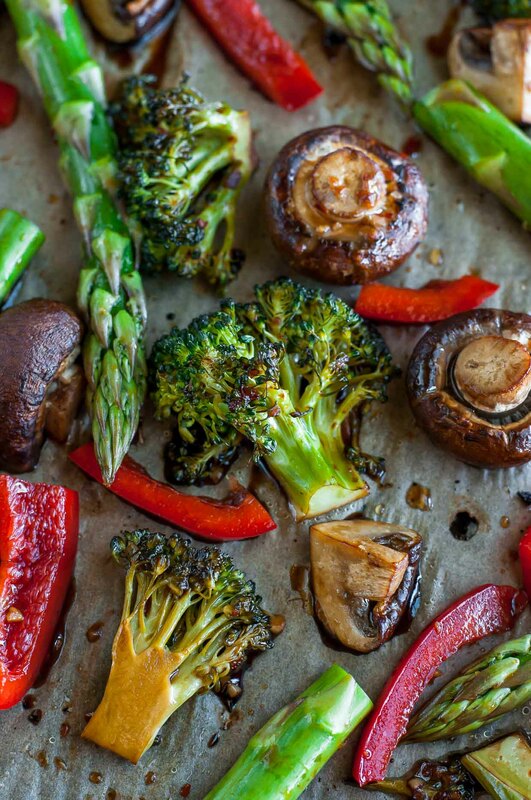 Since I’m always stir frying my face off, I opted for roasted veggies (oh heck yes!) and happily emptied my crisper drawer out onto the sheet pan. The results were delicious and I’m so excited to share these crazy easy roasted veggies with y’all today! Grab a sheet pan and whip up these Easy Teriyaki Roasted Vegetables for a quick + tasty side dish! This one pan recipe pairs great with grains, tofu, chicken and/or seafood too! 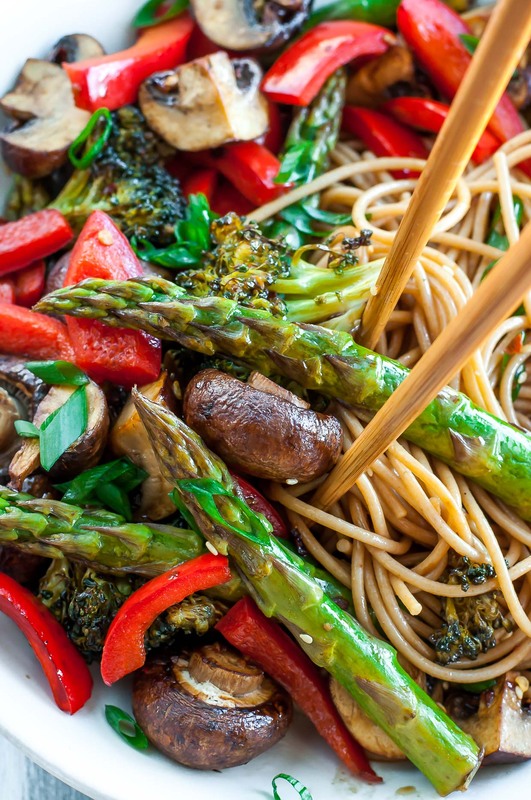 Serve with your favorite asian-style noodles, gluten-free zucchini noodles, quinoa, or rice. Whisk together all sauce ingredients except the corn starch + water. For a spicier sauce add the red pepper flakes. For a mild sweet and savory sauce, skip the pepper flakes. Set aside. Clean and chop your veggies. For the mushrooms, wipe clean with a slightly damp paper towel, trim the stems, then cut each in halves or quarters. I like the leave the smaller ones whole. Roughly chop your broccoli into large florets. Slice the ends off your asparagus, slice bell pepper into sections, and keep separate as they'll be added to the pan last. 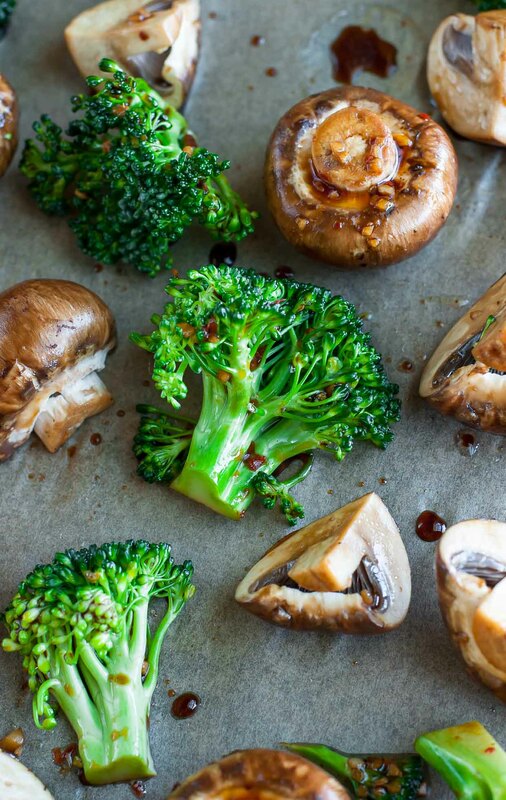 Line sheet pan with parchment paper (if desired) and top with broccoli and mushrooms. Spritz lightly with a little healthy spray oil and drizzle 2-3 TBSP of your sauce over the veggies. While you wait, thicken the sauce. Heat a small saucepan to medium-high heat with your teriyaki sauce. Dissolve your cornstarch in cold water. Once bubbling, add cornstarch mixture to the sauce, stirring vigorously to mix. Reduce heat to simmer. Heat sauce until it reduces to desired thickness, stirring occasionally. Remove from heat and set aside until ready to serve. 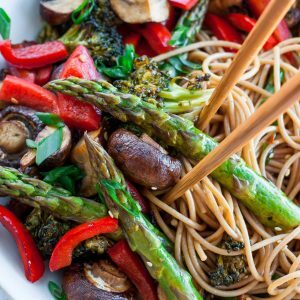 Once your 8 minutes are up on the broccoli/mushrooms, add the asparagus and bell pepper and roast for an additional 8-10 minutes or until desired tenderness. 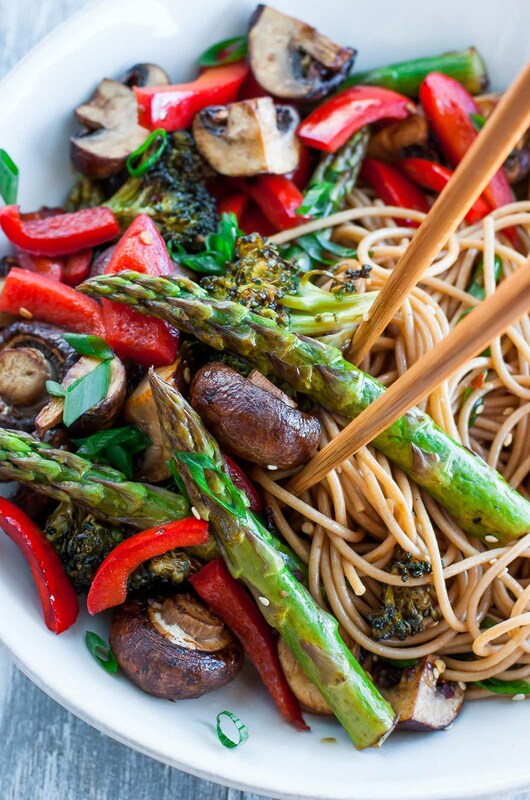 Serve veggies atop a bowl of noodles or rice with teriyaki sauce. * Mirin is a Japanese sweet rice wine available in most grocer's international foods aisle. No mirin? No problem! Simply use white wine or dry sherry with an extra 1 TBSP of honey. I used a little over 1 pound of veggies, feel free to mix and match your favorites based on what you have on hand! Onion would be an amazing addition as would snap peas. Toasted sesame seeds also make a tasty addition for topping this dish. Arrowroot powder, tapioca starch, or potato starch may be used in place of the corn starch to thicken the sauce. GF Tamari may be used as a gluten-free alternative to soy sauce. See post below for a lightened-up sugar-free sauce featuring a balsamic-soy combo that rocks my socks! Though it’s far from authentic teriyaki sauce, this tasty Balsamic Soy Sauce tastes amazing with roasted vegetables! It’s a thin sauce (so more like a marinade) and full of flavor. Whisk above ingredients together and you’re good to go! Feel free to adjust garlic/ginger/soy sauce to taste by adding more to your liking. Extra garlic is always welcome around here! Need extra sauce? Simply double the recipe and you’re good to go. If you get a chance to try these Easy Teriyaki Roasted Vegetables, let me know! This is the meal of my dreams! My mouth is watering just thinking about it! This is the type of meal I could eat almost every night of the week. I love those roasted veggies and the homemade teriyaki sauce. Delish! YUM!! Chowing down on this right now. I did make quite a few adaptations though, but I can tell this is just a dynamite recipe that is totally adaptable. I used a zucchini, some green beans, onion, cabbage, and mushrooms (I have a crop share, and this is what’s in season this week). I also used marsala cooking wine instead of mirin, and piled it high on a bowl of quinoa. SO GOOD! Yes the veggies can all be swapped around so it’s crazy flexible! So glad you enjoyed it Mary! Thank you! This recipe was sooooo delicious, especially the sauce!! But i wasn’t really sure when to add the sauce once i finished cooking it. I ended up just adding it on top of each personal bowl but that didn’t seem right. Am i supposed to mix it in with the veggies once they’re done roasting or what? 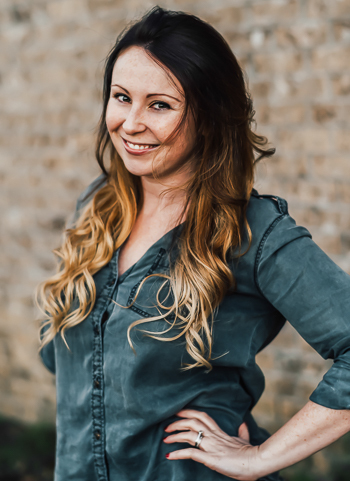 Hey Jerin – so stoked you enjoyed the recipe! Woot! So for the sauce, in step 4 you drizzle 2-3 Tablespoons of sauce over the veggies (the little bit of sauce here will caramelize a bit and season the veggies) and then in step 6 you can thicken the sauce stovetop in a saucepan and then toss with the veggies and grain of choice if you’re adding one, basically like what you did! Just made this today and it is fantastic! The sauce is out of this world delicious! Thanks so much for posting!